Many of the civilian casualties from the air war occurred during U.S. attacks targeting senior Iraqi leaders. The United States used an unsound targeting methodology that relied on intercepts of satellite phones and inadequate corroborating intelligence. Targeting based on geo-coordinates derived from satellite phones in essence rendered U.S. precision weapons potentially indiscriminate. This flawed targeting strategy was compounded by the lack of an effective assessment both prior to the attacks of the risks to civilians (what the U.S. military calls a “collateral damage estimate” or CDE) and following the attacks of their success and utility (what the U.S. military calls a “battle damage assessment” or BDA). The use of air-delivered cluster bombs against targets in or near populated areas also contributed to the civilian death toll, although to a lesser degree. As detailed in the ground war chapter of this report, ground-delivered cluster munitions were a major cause of civilian casualties, while air-delivered cluster weapons caused a relatively small number of civilian casualties. Beyond serious technical or human failures resulting in missed targets, largely avoided in Iraq were the types of attacks that led to significant civilian casualties and civilian suffering in previous U.S. air wars: extensive use of cluster bombs in or near populated areas; destruction of electrical and other dual-use facilities; widespread daylight attacks; and inappropriate targeting choices, particularly with respect to mobile targets. But there were still failures in the conduct of the air war that led to the loss of civilian life or to other civilian harm. The most egregious was the flawed targeting of Iraqi leadership. While to a lesser extent than in other recent conflicts, U.S. and U.K. air forces also used some cluster bombs in or near populated areas. Attacks on certain civilian power facilities caused additional civilian suffering, and the legality of attacks on media installations was questionable. This section contains a synopsis of the air war, an examination of attacks on Iraqi leadership and other emerging targets (including problems related to collateral damage estimates and battle damage assessment), and an analysis of attacks on fixed strategic targets (including electrical power, telecommunications, media, and government and military facilities). Finally, it looks at the problematic use of air-delivered cluster bombs by the United States and the United Kingdom. The major air war effort began at approximately 6:00 p.m. on the same day with an aerial bombardment of Baghdad and the Iraqi integrated air defense system. During the early morning hours of March 21, Coalition air forces attacked targets in Basra, Mosul, al-Hilla, and elsewhere in Iraq. On the night of March 21, precision-guided munitions began destroying government facilities in the Iraqi capital. The air war shifted to attacks on Republican Guard divisions south of Baghdad after the sandstorms of March 25 stalled the ground offensive, but the bombardment of Baghdad continued. U.S. forces hit telecommunications facilities on the night of March 27. Daylight bombing in Baghdad began on March 31, and elements of the Republican Guard around the city bore the brunt of the aerial assault aimed at paving the way for U.S. ground forces. The bombing of government facilities largely ceased by the morning of April 3 when the airport was taken, but attacks on Republican Guard units continued. On April 5, close air support missions flew over Baghdad to support ground combat. The same day, the United States bombed the reported safe house of `Ali Hassan al-Majid (known as “Chemical Ali”) in Basra. On April 7, air attacks targeted Saddam Hussein and other Iraqi leaders in Baghdad. On April 9, Baghdad fell. The U.S. military uses the term “collateral damage” when referring to harm to civilians and civilian structures from an attack on a military target. Collateral damage estimates are part of the U.S. military’s official targeting process and are usually prepared for targets well in advance.26 Since the CDE influences target selection, weapon selection, and even time and angle of attack, it is the military’s best means of minimizing civilian casualties and other losses in air strikes. Collateral damage assessments are a key way for the military to fulfill its obligations under international humanitarian law. International humanitarian law requires an attack to be cancelled or suspended if it is expected to cause loss of civilian life or property that “would be excessive in relation to the concrete and direct military advantage anticipated.”27 Assessment of collateral damage is necessary to perform this proportionality test adequately. For the most part, the collateral damage assessment process for the air war in Iraq worked well, especially with respect to preplanned targets. Human Rights Watch’s month-long investigation in Iraq found that, in most cases, aerial bombardment resulted in minimal adverse effects to the civilian population. The major exception was emerging targets, especially leadership targets. A Department of Defense source told Human Rights Watch that CENTCOM did not perform adequate collateral damage estimates for all of the leadership strikes due to perceived time constraints.33 While the U.S. military hailed the quick turn-around time between the acquisition of intelligence and the air strikes on leadership targets, it appears the haste contributed to excessive civilian casualties because it prevented adequate collateral damage estimates. Emerging targets develop as a war progresses instead of being planned prior to the initiation of hostilities. They include time-sensitive targets (TSTs) that are fleeting in nature (such as leadership), enemy forces in the field, mobile targets, and other targets of opportunity. A significant new problem related to emerging targets, however, was evident in Iraq. The targeting of Iraqi leadership resulted in dozens of civilian casualties that the United States could have prevented if it had taken additional precautions. This phenomenon has gone largely unremarked upon by U.S. military and civilian officials. The United States targeted adversary leadership in prior armed conflicts. It did so in a limited way in Yugoslavia when Slobodan Milosevic’s residence was bombed in an attempt to kill him.37 The effort was more widespread in Afghanistan. 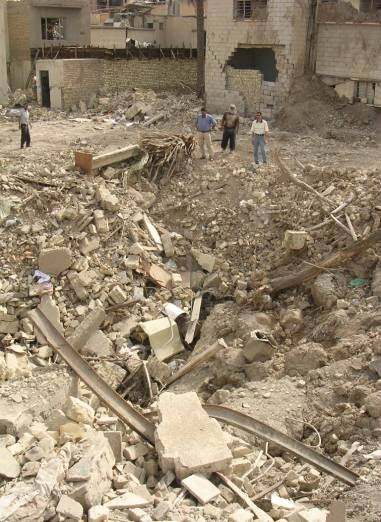 As part of the attempt to kill Taliban leader Mullah Omar and al-Qaeda head Osama bin Laden, the United States bombed homes associated with the two men. It also attacked convoys and destroyed caves in the pursuit of Taliban and al-Qaeda leadership.38 Afghanistan, however, has few population centers, and most attacks occurred in relatively remote areas. In Iraq, by contrast, U.S. planes bombed densely populated neighborhoods in their attacks on Iraqi leadership. The aerial strikes on Iraqi leadership constituted one of the most disturbing aspects of the war in Iraq for several reasons. First, many of the civilian casualties from the air war occurred during U.S. attacks on senior Iraqi leadership officials. Second, the intelligence and targeting methodologies used to identify potential leadership targets were inherently flawed and led to preventable civilian deaths. Finally, every single attack on leadership failed. 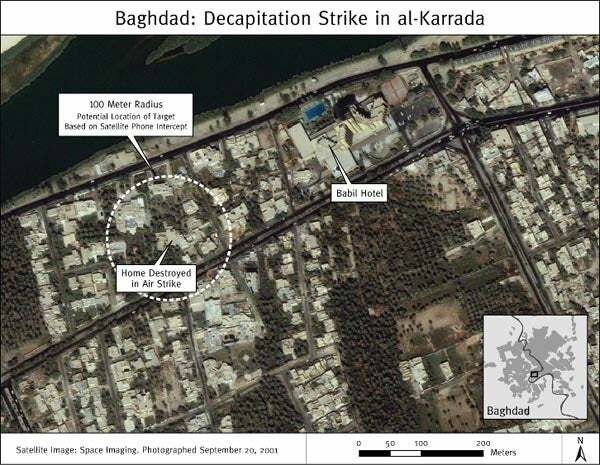 None of the targeted individuals was killed, and in the cases examined by Human Rights Watch, local Iraqis repeatedly stated that they believed the intended targets were not even present at the time of the strike. The dismal record in targeting leadership is not unique to the war in Iraq. Apparently, in both Yugoslavia and Afghanistan, not one of the intended leadership targets was killed in an air strike.44 In fact, the United States in the past has admitted it did not even know at whom it was shooting. Following a November 2001 attack on a suspected leadership target in Afghanistan, Pentagon spokesperson Victoria Clarke stated, “This was a good target. They had a confluence of intelligence which led us to believe there was senior leadership in the building. We don’t have names. We don’t have a sense of exactly who was in there.”45 It is difficult to understand how the military could assess a “good target” if it admits not knowing who the target was. In an August 2003 report, the U.S. Air Force criticized its use of time-sensitive targeting in Afghanistan. Although it had targeted leadership in previous conflicts, the United States introduced the TST process in Afghanistan as it fused highly accurate weapons with the ability to target in near-real time. The report found that a “single authoritative TST process doctrine does not exist” and that “[t]here is no mechanism to measure performance of TST processes.”46 It called on the Air Force to: (1) “develop meaningful metrics to assess the performance of the TST processes, and develop procedures to measure TST process performance during combat operations,” and (2) “study the relationship between TST doctrine and TST technology to determine the extent to which technology drives TST doctrine.47 These criticisms and recommendations apply equally well to time-sensitive targeting in Iraq. The Air Force acknowledged that technology should not be the driving factor behind air strikes; just because a capability exists does not mean it should be used. It also recognized that the targeting process required an ability to measure effectiveness. In Iraq, the fascination with the ability to track targets via satellite phone and the inadequacies of the battle damage assessment process contributed to the failure of leadership targeting. In attacking leadership targets in Iraq, the United States used an unsound targeting methodology largely reliant on imprecise coordinates obtained from satellite phones. Leadership targeting was consistently based on unreliable intelligence. It is also likely that Iraqi leaders engaged in successful deception techniques. This combination of factors led directly to dozens of civilian casualties. The United States identified and targeted some Iraqi leaders based on GPS coordinates derived from intercepts of Thuraya satellite phones.48 Thuraya satellite phones are used throughout Iraq and the Middle East. They have an internal GPS chip that enabled American intelligence to track the phones. The phone coordinates were used as the locations for attacks on Iraqi leadership. Targeting based on satellite phone-derived geo-coordinates turned a precision weapon into a potentially indiscriminate weapon. According to the manufacturer, Thuraya’s GPS system is accurate only within a one-hundred-meter (328-foot) radius.49 Thus the United States could not determine from where a call was originating to a degree of accuracy greater than one-hundred meters radius; a caller could have been anywhere within a 31,400-square-meter area. 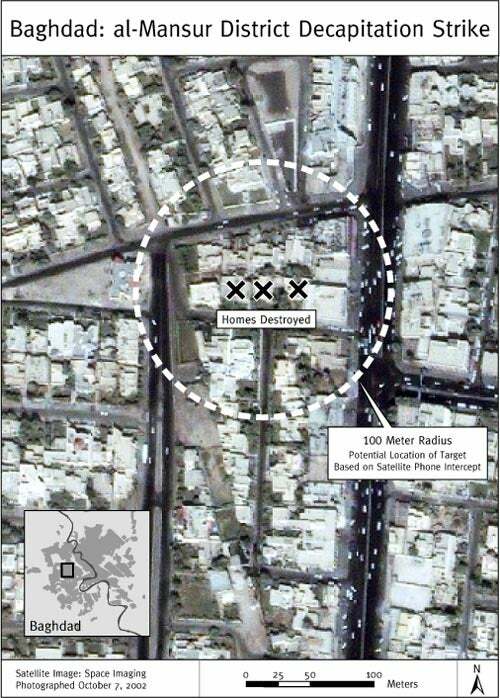 This begs the question, how did CENTCOM know where to direct the strike if the target area was so large? In essence, imprecise target coordinates were used to program precision-guided munitions. Furthermore, it is not clear how CENTCOM connected a specific phone to a specific user; phones were being tracked, not individuals. It is plausible that CENTCOM developed a database of voices that could be computer matched to a phone user. The Iraqis may have employed deception techniques to thwart the Americans. It was well known that the United States used intercepted Thuraya satellite phone calls in their search for members of al-Qaeda.50 CENTCOM was so concerned about the possibility of the Iraqis turning the Thuraya intercept capability against U.S. forces that it ordered its troops to discontinue using Thuraya phones in early April 2003. It announced, “Recent intelligence reporting indicates Thuraya satellite phone services may have been compromised. For this reason, Thuraya phone use has been discontinued on the battlefields of Iraq. The phones now represent a security risk to units and personnel on the battlefield.”51 It is highly likely the Iraqi leaders assumed that the United States was attempting to track them through the Thuraya phones and therefore possible that they were spoofing American intelligence. The United States undoubtedly attempted to use corroborating sources for satellite phone coordinates. Based on the results, however, accurate corroborating information must have been difficult if not impossible to come by and additional methods of tracking the Iraqi leadership just as unreliable as satellite phones. Satellite imagery and signals intelligence (communications intercepts) apparently yielded little to no useful information in terms of targeting leadership. Detection of common indicators such as increased vehicular activity at particular locations seems not to have been meaningful. Human sources of information were likely the main means of corroborating the satellite phone information in tracking the Iraqi leadership. A human intelligence source was reportedly used to verify the Thuraya data acquired in the attack on Saddam Hussein in al-Mansur, described below.52 But the source was proven wrong. Human sources were also reportedly used to verify the attack on `Ali Hassan al-Majid in Basra, as well as the strike on al-Dura that opened the war.53 Given the lack of success, it seems human intelligence was completely unreliable. Without reliable intelligence to identify the location of the Iraqi leadership, it appears the United States fell back upon all it had, namely, inaccurate coordinates based on satellite phones, with no guarantee of the identity of the user. Leadership targets developed by inaccurate data should have never been attacked. With respect to the leadership attacks in Iraq it appears that effective BDA was not performed. The battle damage assessments should have led the United States to realize the leadership targeting was ineffective before a full fifty missions were flown. If attacks are repeatedly unsuccessful and result in significant civilian casualties, the entire target set should be reassessed. Leadership targeting should never have been allowed to reach such a high number of failed strikes that led to significant civilian deaths. Human Rights Watch’s investigations in Iraq found that attacks on leadership likely resulted in the largest number of civilian deaths from the air war. The following case studies illustrate the impact on civilians of the flawed targeting methodology and intelligence used in leadership attacks. 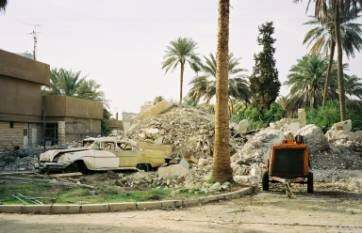 The war opened on March 20 with an attempted attack on Saddam Hussein. This strike was the beginning of a pattern that would be repeated many times. 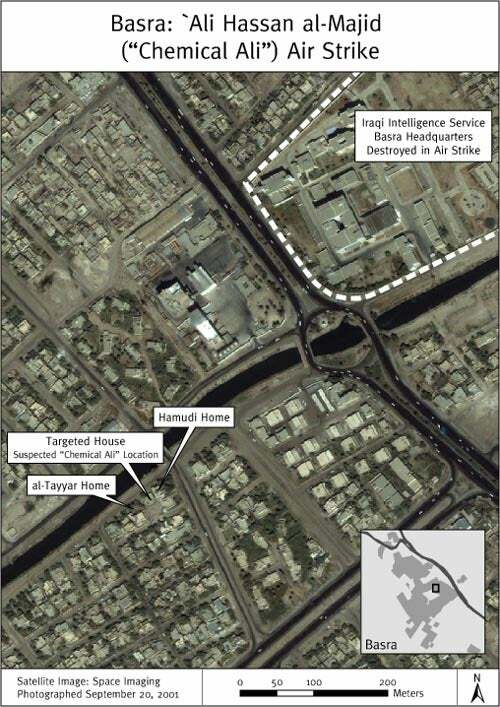 The U.S. military targeted a facility in the mistaken belief that the Iraqi leadership was there; instead of “decapitating” the regime, this strike resulted in fifteen civilian casualties because of faulty intelligence. According to Salih, there were no obvious military targets in the area. He speculated that a bitter family rival lied to the Americans. He said, “Perhaps someone wanted to kill them because of jealousy and told them [the Americans] Saddam or one of his men were there. But my family had no dealings with the regime. 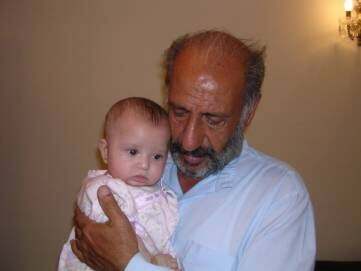 We hate Saddam.”75 A Department of Defense official told Human Rights Watch that Saddam Hussein’s half-brother Watban was the intended target of this air strike, and that he was identified through poor communications security.76 This was likely a Thuraya intercept. Watban was eventually captured near the Syrian-Iraqi border near the end of the war almost a week later. On April 7, a U.S. Air Force B-1B Lancer aircraft dropped four 2,000-pound satellite-guided Joint Direct Attack Munitions (JDAMs) on a house in al-Mansur district of Baghdad.79 The attack killed an estimated eighteen civilians. Under international humanitarian law, the targeting of military leadership is permissible, even if it results in civilian casualties, so long as the anticipated concrete and direct military advantage outweighs the civilian cost. Aerial strikes targeting the leadership of a party to the conflict (“decapitation strikes” in U.S. military parlance) are governed by the same rules of IHL that apply to other military actions: the individual attacked must be a military target92 and the attack must not be indiscriminate, i.e., it must distinguish between civilians and combatants, and it must not cause harm to the civilian population or civilian objects which could be “excessive in relation to the concrete and direct military advantage anticipated” from the attack.93 Human Rights Watch did not assess the military advantage of eliminating specific Iraqi military leaders, but the United States is required to carry out this balancing act prior to launching decapitation strikes. If they respect these criteria, attacks on enemy leaders who take a direct part in hostilities are not prohibited and are different from assassinations committed outside the context of an armed conflict, which are extrajudicial executions prohibited by international human rights law.94 Aerial strikes on leadership targets, however, still require a particularly high level of scrutiny. The U.S. armed forces should perform a thorough investigation of the battle damage assessment process, determine how it can be improved to mitigate civilian casualties, and implement appropriate changes. Complete a collateral damage estimate in advance and balance this against the expected direct and concrete military advantage of the attack. Use the smallest effective precision munitions to limit civilian harm. Carry out a bomb damage assessment as soon as possible after the attack and apply immediate lessons learned. The United States has committed itself to all these steps, but it needs to implement them more consistently. Strikes should not be based solely on satellite phone intercepts. There should be no strikes in densely populated areas unless the intelligence is considered highly reliable. 21 Lieutenant General T. Michael Moseley, U.S. Air Force, “Operation Iraqi Freedom—By The Numbers,” April 30, 2003, p. 11 [hereinafter “Operation Iraqi Freedom—By The Numbers”]. This report cites a total of 19,948 guided weapons, including guided cluster bombs, but guided cluster bombs cannot be considered precision weapons because of their large dispersal area. In terms of raw numbers, 1,263 more PGMs were dropped in the first Gulf War than in the 2003 Iraq war. General Accounting Office, “Operation Desert Storm: Evaluation of the Air Campaign,” GAO/NSIAD-97-134, June 1997, appendix 4, table IV.4 (Unit Cost and Expenditure of Selected Guided and Unguided Munitions in Desert Storm). 22 Herman L. Gilster, “Desert Storm: War, Time, and Substitution Revisited,” Airpower, Spring 1996, p. 8; Michael Kelly, “The American Way of War,” Atlantic Monthly,June 2002, p. 16; Gerry Gilmore, “Crusader Not ‘Truly Transformational,’ Rumsfeld Says,” American Forces Press Services, May 16, 2002. 23 See Human Rights Watch telephone interview with senior CENTCOM official #1, Tampa, September 27, 2003. 24 A useful timeline of the war was published in The Guardian and is available at www.guardian.co.uk. All dates and times in this section are local Iraq times. 25 Technical Sergeant Mark Kinkade, “The First Shot,” Airman, July 23, 2003, http://www.af.mil/news/airman/0703/air.html (retrieved November 13, 2003). 26 “Targeting and Collateral Damage,” U.S. CENTCOM Briefing, March 5, 2003. 27 Protocol I, art. 57(2)(b). 28 Human Rights Watch telephone interview with senior CENTCOM official #1. 29 Bradley Graham, “U.S. Moved Early for Air Supremacy,” Washington Post, July 20, 2003, p. A26. 30 Human Rights Watch telephone interview with senior CENTCOM official #1. 31 Human Rights Watch telephone interview with senior CENTCOM official #2, Tampa, September 27, 2003. 32 Major General Stanley McChrystal, “Coalition Targeting Procedures,” Foreign Press Center Briefing, April 3, 2003. 33 Human Rights Watch interview with Department of Defense official, Washington, D.C., August 2003. 34 See, for example, Human Rights Watch, “Civilian Deaths in the NATO Air Campaign,” A Human Rights Watch Report, vol. 12, no. 1 (D), February 2000. This report identifies seven attacks on civilian convoys. There were other problematic attacks on emerging targets in Yugoslavia and Afghanistan. See “Afghanistan Civilian Deaths Mount,” BBC News Online, January 3, 2002, http://news.bbc.co.uk/1/hi/world/south_asia/1740538.stm (retrieved October 21, 2003). 35 On March 24, 2003, a U.S. warplane attacking a bridge about one hundred miles (160 kilometers) from the border with Syria accidentally bombed a bus crossing the bridge, according to Major General McChrystal. Syria claimed five civilians were killed and ten injured. “Civilians Killed in Northern Air Assault,” Australian Broadcasting Corporation News Online, March 25, 2003, http://www.abc.net.au/news/newsitems/s815316.htm (retrieved October 20, 2003); “Syria Says Bus Carrying Civilians Bombed by Coalition Plane,” PBS Online NewsHour, March 24, 2003, http://www.pbs.org/newshour/updates/syria_03-24-03.html (retrieved October 20, 2003). 36 Destroyed Iraqi military vehicles litter the Iraqi countryside. Many were destroyed by air strikes before U.S. ground forces were anywhere near them. During an interview, Colonel David Perkins, commanding officer of the Second Brigade, Third Infantry Division, stated that precision-guided bombs hit many Iraqi vehicles long before his forces encountered them. Later, when scout units found Iraqi forces, U.S. ground forces would often call in air strikes instead of engaging with them with direct fire. Human Rights Watch interview with Colonel David Perkins, commanding officer, Second Brigade, Third Infantry Division, U.S. Army, Baghdad, May 23, 2003. 37 Bradley Graham, “Missiles Hit State TV, Residence of Milosevic,” Washington Post, April 23, 1999. 38 “U.S. Official Says Bin Laden Running Out of Options,” Los Angeles Times, December 11, 2001. 39 “Operation Iraqi Freedom—By The Numbers,” p. 9. This document identifies three types of TSTs: leadership, weapons of mass destruction, and terrorists. It states there were 102 attacks on weapons of mass destruction, fifty on leadership, and four on terrorists. Ibid. 40 Human Rights Watch telephone interview with senior CENTCOM official #2. 42 For the status of the fifty-five most wanted, see U.S. CENTCOM, “Iraqi 55 Most Wanted List,” n.d., http://www.centcom.mil/Operations/Iraqi_Freedom/55mostwanted.htm (retrieved October 20, 2003). 43 For example, an air strike in al-Shatra at 3:15 p.m. on April 4 killed six civilians and injured thirty-eight. Human Rights Watch interview with Dr. Salih Qadum, director, al-Shatra General Hospital, al-Shatra, May 27, 2003. This attack may have targeted `Ali Hassan al-Majid (known as “Chemical Ali”); al-Shatra is on the road to Basra, where the Coalition targeted al-Majid the next day. Four strikes in al-Rashidiyya, a town north of Baghdad, around 10:00 p.m. on April 6, killed forty-three civilians and injured twenty-four. Civilians reported that Saddam Hussein was rumored to be in the area and some said they saw an expensive Mercedes speeding through the streets before the bombs fell. Human Rights Watch interviews with `Ali Hirat `Abid, Hadi `Abid `Ali, `Abdullah Latif Hamid, `Abd al-Rahman `Abd al-Latif Ahmad, and Mahmud `Ali Hamada, al-Rashidiyya, October 16, 2003. 44 This does not include attacks with armed Predator drones. These attacks are different from the others in that Predator allows visual confirmation of the target during strikes. 45 “U.S. Planes Blitz Leaders’ Compound,” South China Morning Post, November 29, 2001. 46 Leonard LaVella, “Operation Enduring Freedom Time Sensitive Targeting Process Study,” Air Combat Command Analysis Division, Directorate of Requirements, August 25, 2003. 48 Michael Knights, “U.S.A. Learns Lessons in Time-Critical Targeting,” Jane’s Intelligence Review, July 1, 2003; Carl Cameron, “Intelligence Key to Strike on Leadership Target,” FOX News, April 9, 2003, www.foxnews.com/story/0,2933,83611,00.html (retrieved October 21, 2003); “Tip about Hussein Leads to Fierce Baghdad Battle That Kills 1 Marine,” Knight Ridder News Service, April 10, 2003; “Suspected Saddam Hideout Slammed by Fierce Bombing,” Knight Ridder News Service, April 8, 2003; Brian Ross, Rhonda Schwartz, and Jill Rackmill, “Missed Opportunity? U.S. Attack May Have Ended Saddam Surrender Attempt,” ABC News.com, April 21, 2003, http://abcnews.go.com/sections/wnt/World/iraq030421_missed_deal.html (retrieved October 20, 2003). 49 Thuraya Satellite Telecommunications Company, “Extensive Roaming and Superior Connectivity,” n.d., http://www.thuraya.com/products/services_marketing.htm (retrieved October 20, 2003). A user must be outside with an unobstructed view of the sky to receive a Thuraya signal. 50 Jason Burke, “Bin Laden Still Alive, Reveals Spy Satellite,” The Observer, October 6, 2002; “Laden Is Alive and Regularly Meeting Omar: U.S. Report,” Times of India, October 7, 2002; “FBI Tracking Muslims to Trace al-Qaeda Men,” The Pioneer, October 7, 2002. 51 U.S. CENTCOM, Headquarters, “Use of Thuraya Phones Discontinued,” News Release 03-04-43, April 3, 2003. 52 John Donnelly, “War in Iraq/Targeting the Leadership; After Airstrike, U.S. Seeks Clues on Fate of Hussein and Sons,” Boston Globe, April 9, 2003, p. A21. 54 For example, attacks with armed Predator drones allow visual confirmation of the target during strikes. 56 An example of the potential effectiveness of BDA is the application of lessons learned in the NATO campaign in Yugoslavia during the war. Civilians were killed on the Djakovica-Decane Road when U.S. aircraft incorrectly identified civilian convoys as military in nature. The U.S. military and NATO learned what they were doing wrong and changed the rules of engagement. See Human Rights Watch, “Civilian Deaths in the NATO Air Campaign,” p. 21. 57 Human Rights Watch telephone interview with senior CENTCOM official #2. 59 Barton Gellman and Dana Priest, “Surveillance Provided Unforeseen ‘Target of Opportunity,’” Washington Post,March 20, 2003. 60 Robert Burns, “Opening Round of War Targets Saddam; Iraq Fires at Troops,” Associated Press, March 20, 2003. 62 Marian Wilkinson, “Decapitation Attempt Was Worth a Try, George,” Sydney Morning Herald, March 22, 2003. 63 See Human Rights Watch, Genocide in Iraq: The Anfal Campaign Against the Kurds (New York: Human Rights Watch, 1993). 64 Bill Brink, “Former Iraqi Official Known as ‘Chemical Ali’ Is Captured,” New York Times, August 21, 2003. 65 Human Rights Watch interview with `Abd al-Hussain Yunis al-Tayyar, Basra, April 22, 2003; Human Rights Watch interview with `Abid Hassan Hamudi, Basra, April 22, 2003. 66 Human Rights Watch interview with `Abd al-Hussain Yunis al-Tayyar; Human Rights Watch interview with `Abid Hassan Hamudi. 67 Human Rights Watch interview with `Abd al-Hussain Yunis al-Tayyar. 68 Human Rights Watch interview with `Abid Hassan Hamudi. 70 Keith B. Richburg, “In Basra, Growing Resentment, Little Aid; Casualties Stoke Hostility Over British Presence,” Washington Post, April 9, 2003, p. A23. 71 The precision-guided munition may have missed its target due to mechanical, electrical, or human error. 72 Human Rights Watch telephone interview with senior CENTCOM official #2. 73 Human Rights Watch interview with Sa’dun Hassan Salih, Baghdad, May 18, 2003. 74 Human Rights Watch interview with `Imad Hassan Salih, Baghdad, May 18, 2003. 75 Human Rights Watch interview with Sa’dun Hassan Salih. 76 Human Rights Watch interview with Department of Defense official. 77 Human Rights Watch interview with Sa’dun Hassan Salih. 78 Human Rights Watch interview with Sa`ad `Abd al-Rasul `Ali, Baghdad, May 17, 2003. 79 David Blair, “Smart Bombs Aimed at Saddam Killed Families,” Daily Telegraph, April 21, 2003, p. 11. 81 “Saddam May Be Dead,” Knight Ridder Newspapers, April 8, 2003. 83 Human Rights Watch interview with Department of Defense official. 84 Mark Thompson and Timothy J. Burger, “How to Attack a Dictator, Part II,” Time, April 21, 2003. 85 Human Rights Watch interview with Ahmad al-Sibi, Baghdad, May 22, 2003. 86 Rowan Scarborough, “Saddam Seen at Site,” Washington Times, April 9, 2003. 88 David Rohde, “Bomb Crater Probed in Search for Saddam,” New York Times, June 6, 2003, p. A1. 89 “Bremer Says Saddam Alive, Not Behind Attacks,” Associated Press, July 21, 2003; Guy Taylor, “CIA Says Al Jazeera Audiotape ‘Most Likely’ Saddam,” Washington Times, July 8, 2003; “CIA Reported to Believe Saddam is Alive,” United Press International, June 3, 2003. 90 CEP is “the radius of a circle within which half of a missile’s projectiles are expected to fall.” U.S. Department of Defense, “Dictionary of Military Terms,” June 5, 2003, http://www.dtic.mil/doctrine/jel/doddict (retrieved October 21, 2003). 92 Protocol I, arts. 48, 52(2). 93 Ibid., arts. 51(5)(b), 57(2). 94 Since 1976, successive U.S. presidents, including President George W. Bush, have endorsed an executive order (Executive Order 12333) banning political assassinations. This order followed revelations of earlier U.S. assassinations and assassination attempts of various world leaders. Consonant with the rules outlined above, this order does not prohibit targeting enemy combatants and their commanders in an armed conflict, and it does not prohibit the use of lethal force by law enforcement agents when necessary to avoid imminent death or serious injury. But it rightfully prohibits summary execution in any circumstance and the targeted killing of people (other than combatants in armed conflict) in lieu of invoking available criminal justice remedies. See Executive Order 12333 of December 4, 1981, 3 C.F.R. 200 (1981 comp.). 95 Protocol I, art. 57(2)(a).